Progress Bank strives to bring you the technology to make your financial life a little easier. We are now offering mobile wallet support, so you can pay for your purchases with your mobile device without ever reaching for your actual wallet. It's secure, fast and convenient. For more information and helpful videos, please visit the sites below. Store your Progress Bank debit card digitally on your phone. 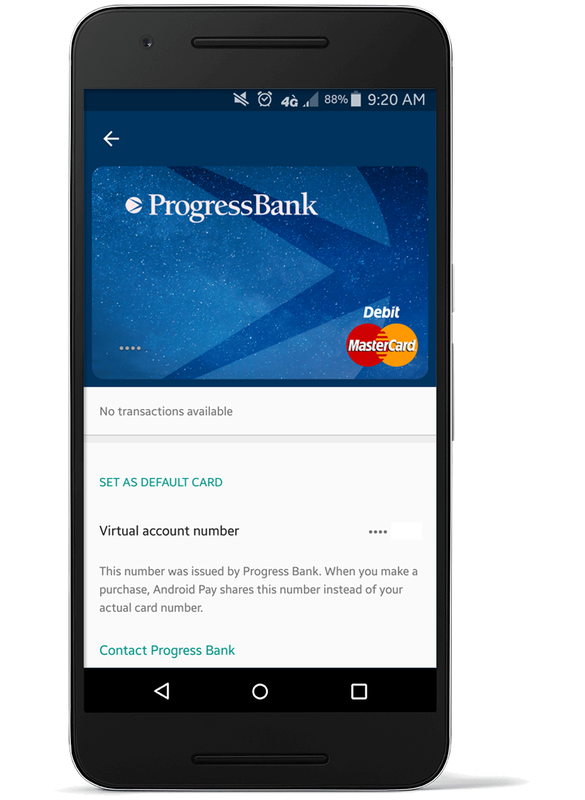 Register your Progress Bank debit card with your phone's mobile wallet, then call the provided number to verify your debit card and you're ready to go. * If you use an Android device and hear the line mention Apple Pay, continue to stay on the line as the verification is done by an operator and not automatically. At the merchant, place your unlocked phone near the card reader to authorize your payment, tap to confirm, and you're good to go. * Some Apple and Samsung devices allow for fingerprint touch authorization. If you're in the merchant app, you also have the option to use your fingerprint to pay with compatible devices. SECURITY: When you use one of these mobile wallets, your card number is replaced by a unique code (or "token") for each transaction. That means your actual debit card numbers are never shared. You're covered by our $0 liability guarantee for unauthorized purchases. CONVENIENCE: Pay on the go at participating merchants who accept Mastercard® .